My wife and I are setting off on another adventure. This time it will be in the province of Sao Paulo, Brazil. We are doing an ultra-marathon that consists of running on beaches, roads, and trails for almost 48 miles total with a 10-hour time limit. We have never done anything like this so we had to start our training immediately. Running just a marathon is hard enough, but almost doubling that distance and running through varying terrain makes this race even more difficult. We have to train long and hard to make sure our bodies can endure the long challenge ahead. My wife and I started our training earlier this year by doing the Pittsburgh Marathon events last May. Now we have started implementing more trails to get used to a different style of running. Trail running is a different breed of running. It is more challenging compared to running on the road or sidewalk: you have to pay attention to every step and your surroundings — even possible animals nearby. Yes, I said animals. We have encountered a number of deer, squirrels, chipmunks, rabbits, and turkeys flying up on top of trees. 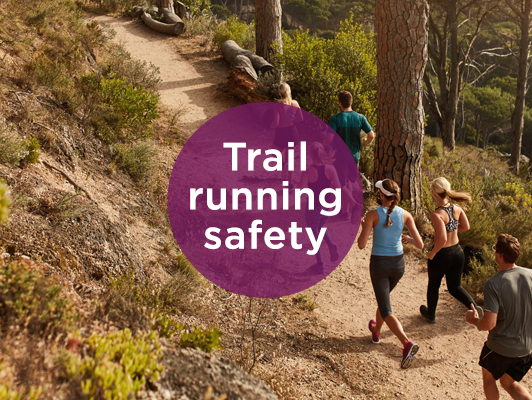 Thanks to the past two months of trail running, we have learned a few running safety tips. 1. Do some research on nearby trails. You might want to start off with the easier trails before heading into the more technical ones. Technical trails will have more rocks, roots, and possibly some climbing that involves utilizing your hands as well. 2. Try to run with someone. I always feel safer when I am running with my wife or a group of people on the trails. I recently bought a set of walkie talkies for my wife and myself just in case one of us gets too far ahead and we don’t have cell-phone service. We also have a set of whistles that are attached to our hydration pack. If you are running alone on the trails, make sure you check in with someone before heading out. You can send a text message to a family member or even leave a note at your house or apartment. Make sure you have some type of ID with you for emergencies and even a little first aid kit. 5. Be prepared for the environment. Have some type of protection with you from the environment. Make sure you have bug spray and/or sunscreen to protect you from the elements. Just for extreme measures from animals, consider packing pepper spray for protection. 6. Pack enough hydration and fuel. Trails will not have water fountains or a convenience store to stop in and buy hydration and food. Make sure you plan accordingly based on the length of your run and the weather. 7. Don’t wear your headphones. Enjoy the nature around you and it will be easier to listen for any warnings on the trail. 8. Dress appropriately for the run. Check the weather before heading out and make sure you dress accordingly. Wear layers for cooler days and a rain jacket for rain. Also make sure you are wearing trail shoes that provide good traction for uneven and slippery surfaces. 9. Know how to fall properly. I have already fallen several times and the first thing I try to do is avoid any sharp dangerous objects as best as I can. To absorb the fall I kept my arms close to my chest with the palms out (keeping the arms out has a higher risk for injury). After a run, make sure you are stretching and rehydrating. This will allow you to get back on the trails sooner. With these 10 tips under your belt you’re ready to hit the trails and have a safe, enjoyable trail run. Which trails are you looking forward to hitting? Let us know in the comments below!